On November 9, 2018, President Trump issued a presidential proclamation suspending the entry of aliens through the southern border of the United States at any location other than a port of entry, or international bridge. On the same day, the Department of Homeland Security (DHS) and the Department of Justice (DOJ) issued a related federal rule barring asylum seekers from qualifying for asylum if they enter the United States in violation of a presidential proclamation suspending entry along the southern border of the United States. Together, the presidential proclamation and the federal rule create a bar to asylum for asylum seekers who enter the United States through the southern border at a location other than a port of entry. The presidential proclamation and federal rule only apply to people who enter the United States (or depart and then reenter the United States) after November 9, 2018. The rule does not impact withholding of removal or protection under the U.N. Convention Against Torture (CAT), two forms of relief from removal that are related to asylum but provide fewer benefits. The presidential proclamation states that it does not limit the statutory protections provided to unaccompanied alien children. However, the statutes cited in the proclamation address issues such as the screening, custody, and care of unaccompanied alien children, but not asylum. Therefore, under the presidential proclamation and federal rule, unaccompanied alien children who enter the United States after November 9, 2018 through the southern border at a location other than a port of entry are not exempt from the bar to asylum. The presidential proclamation and federal rule refer to “a substantial number of aliens primarily from Central America” who are “traveling in large, organized groups through Mexico,” suggesting that the proclamation and rule were issued in response to the “caravan” of migrants and asylum seekers who recently arrived at the Tijuana - San Diego border. The DHS and the DOJ rely mainly on two sections of the Immigration and Nationality Act (INA) as justification for the rule. First, they rely on INA § 212(f), which was used as a basis for President Trump’s “travel ban,” upheld in Trump v. Hawaii, 138 S. Ct. 2392 (2018). The DHS and the DOJ claimed they were exempt from the usual Notice-and-Comment requirements, when issuing the rule, based on the “foreign affairs” exemption. They argued that the rule would impact negotiations with Mexico and Central American countries regarding how to address migration issues. They also claimed a “good cause” exemption from the 30 day period usually required before a new rule goes into effect, arguing that immediate implementation of the rule was necessary to avoid creating an incentive for people to cross the border during the Notice-and-Comment period. On November 9, 2018, the American Civil Liberties Union (ACLU), the Southern Poverty Law Center (SPLC), and the Center for Constitutional Rights filed a suit to challenge the presidential proclamation and federal rule. 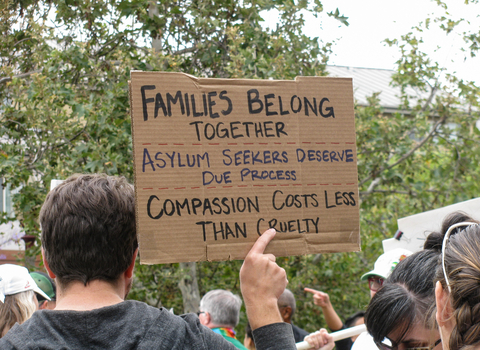 In their complaint in East Bay Sanctuary Covenant v. Trump, the organizations argue that: 1) the proclamation and rule are contrary to the Immigration and Nationality Act and exceed the authority of president and the Attorney General, and 2) it was improper for the DHS and the DOJ to issue the rule without following Notice-and-Comment procedures. The groups also asked for an injunction, arguing that the plaintiffs, organizations who provide services to immigrants and refugees, would be harmed if the proclamation and rule were to go into effect. On November 19, 2018, Federal Judge Jon S. Tigar from the U.S. District Court for the Northern District of California granted a nationwide temporary restraining order preventing the presidential proclamation and federal rule from going into effect. Judge Tigar’s ruling highlights his concerns regarding the legal viability of the presidential proclamation and rule. In his decision, he noted that the rule conflicts with the Immigration and Nationality Act, the intent of Congress, and the United States’ international treaty obligations. He also noted significant concerns regarding the justification for eliminating Notice-and-Comment procedures in this case. On November 27, 2018, however, the Defendants filed a Notice of Appeal in the Ninth Circuit to appeal the temporary restraining order issued by Judge Tigar. They also filed a motion with Judge Tigar to stay the temporary restraining order, essentially asking him to reconsider his decision. The Ninth Circuit appeal remains pending. For more information on asylum and other immigration issues, please contact Kolko & Associates, P.C. Alyssa Telander is an Associate Attorney at Kolko & Casey, P.C. in Denver, Colorado.